Peterborough Phantoms produced a late surge to complete a full set of home triumphs against English Premier League leaders Telford last night (December 18). It was the ice hockey equivalent of the tortoise and hare at Planet Ice as the city side were undone by the fast-starting Tigers before gradually gaining control of the game and eventually putting their short-benched visitors to the sword as they ran on empty in the final session to collect a 3-1 success. The pattern of play didn’t surprise coach Slava Koulikov, who enjoyed a fine return to the Phantoms bench following a difficult week of World Championship hockey with the Great Britain Under 20 side, and was delighted to provide an early Christmas present for the club’s fans by completing a hat-trick against the table-toppers. 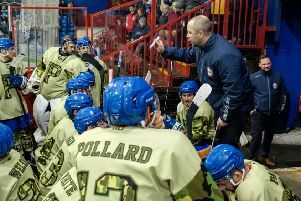 Koulikov said: “Telford were pretty amazing in the first period and we struggled to keep hold of them, but we started to control the game in the second period and won it in the third period. “It was all about keeping ourselves in contention to start with because we knew the odds would be in our favour the longer the game went on. “Had we been 3-0 or 4-0 down, we would have been in trouble, but we managed to keep Telford to one goal and then turned it around. That didn’t look a likely scenario early on as Phantoms were behind within a minute of the puck dropping. Telford forward Corey McEwen gobbled up a rebound in front of the net after netminder Janis Auzins had blocked a Danny Rose shot through traffic. At that point it seemed to be going perfectly to plan for the light-on-bodies, but high-on-fans table-toppers as they burst from the blocks in the manner of a champion sprinter. No doubt their aim was to build up a match-winning advantage early on, while Phantoms weren’t helped by the loss of Scott Robson following a hit by the boards from Telford captain Jason Silverthorn. The defenceman was immediately despatched down the road to Peterborough City Hospital where he received several stitches to repair a chin wound. But his fellow blue-liners stood strong in his absence, helped by plenty of smart work from Auzins. A double-save to deny McEwen a second goal early in the second period was probably the pick of his contributions. That was a rare moment of threat from Telford as Phantoms controlled much of the possession without ever looking particularly likely to score themselves in the middle session. The fact they managed only a couple of weak shots during one minute and 38 seconds of five-on-three was the perfect illustration of that. But it was a different story in the final period as two of their imports engineered an excellent turnaround. Only 10 seconds had passed when Wehebe Darge reacted quickly to swipe in a leveller that left Telford complaining about an over-watered ice surface. And soon they had the sinking feeling as Ales Padelek took centre stage with two goals in a shade under four minutes. The Czech veteran produced combined a great reach with a fine finish to put his side ahead before sealing a sixth win in seven games when rifling a rocket past Tigers netminder Sam Gospel. With a two-goal cushion, big Phantoms man Petr Stepanek finally granted Telford enforcer Doug Clarkson his wish of a scrap. The two giants battled for the second time this season and while it was a victory for Clarkson, the Tigers import’s actions did little to help his side claw their way back into the contest as he sat out all but a few seconds of the remainder of the game. The visitors did have a go, though. They pulled netminder Gospel with just over two minutes remaining and Phantoms defenceman Ben Russell almost immediately picked up a delay-of-the-game penalty. That was the cue for a six-on-four siege from Telford, but they couldn’t turn their ample pressure into clear chances and it was Phantoms who came closest to another goal when Tom Norton rolled an empty-net effort, from the opposite end of the rink, just wide. But they had already done enough to earn another notable success – one which lifted them back into fourth place in the EPL standings. It’s a position Phantoms will seek to maintain during a hectic schedule of five games in eight days during the festive period. The first of those is a Boxing Day trip to fierce rivals Milton Keynes ahead of a return clash 24 hours later on Tuesday, December 27.